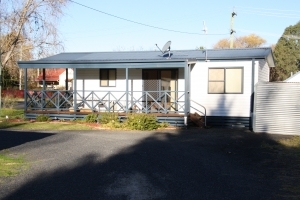 Situated with signs just off highway in historic country town. Room to expand. 45 registered sites on 2.5 acres in nicely treed area. Includes 2 bedroom residence and office. Amenities block and covered BBQ. 8 vans owned by leasee. 6 tenant owned homes. New 5 year plus 5 year option lease. Net $43,000 Asking $350,000.